There's now at least one concrete thing we confirm about the upcoming Terminator 6 soft reboot by Deadpool's Tim Miller and producer James Cameron: it will be called Terminator: Dark Fate, as has been rumored for months. The confirmation on the Dark Fate title comes from a report from Deadline about how Terminator 6 is still set on a collision course with the upcoming Charlie's Angels's reboot from Elizabeth Banks; both films are set to open on November 1st, and neither Paramount (Terminator) or Sony (Charlie's Angels) seems ready to revise their respective release plans. The name "Dark Fate" will get fans of the franchise buzzing with speculation. Terminator's time-travel plotline has always been centered around the theme of "no fate," as in "no fate but the one we make." It was what allowed Kyle Reese and later Sarah Connor to fight against such impossible odds to change the timeline and mankind's Judgment Day in Cameron's first two Terminator films. Like so much of the core franchise, that theme got lost in later sequels; the switch to "Dark Fate" makes it seem like humanity now has less option about the future it's creating: it sounds almost like self-destruction has been determined as the inevitable path of our existence, with the machines being our natural successors. Franchise star Arnold Schwarzenegger recently spoke about his return for Terminator 6, promising that this new installment Tim Miller and James Cameron have cooked up will actually blow fans away. "I’ve seen 15 minutes and it looked great and I was very excited about it... It was a very interesting film to do with Tim [Miller]… the dynamic, between him and with Jim Cameron producing. So Jim Cameron is right now directing Avatar films so he’s taken on this enormous challenge and he’s very busy with that BUT he’s a control freak and as you know, Terminator is kind of his baby. So he does get involved in the filming. There were interesting discussions about which direction to go with a certain scene or how the dialogue should finish or what the certain look should be of an individual and all that stuff so there was a big collaboration between Jim and Tim Miller. I feel it was in good hands with both of them." Despite the critical and box office failure of Terminator Genisys, Dark Fate is getting a significant investment from Paramount, as Schwarzenegger also confirmed. "The budget was somewhere between 160 million and 200 million dollars," he said. "I couldn’t tell you exactly because the movie isn’t finished yet. It’s still being worked on. Visual effects are being done now." Marvel's new Ghost Rider, Gabriel Luna, will be playing the new Terminator robot that returning franchise icons Linda Hamilton and Arnold Schwarzenegger will face. Natalia Reyes and Mackenzie Davis are playing new characters Dani Ramos and Grace (respectively), who may be more than the human characters they're being presented as. Hopefully this title confirmation is leading to the first teaser trailer release, and we'll know more details soon. 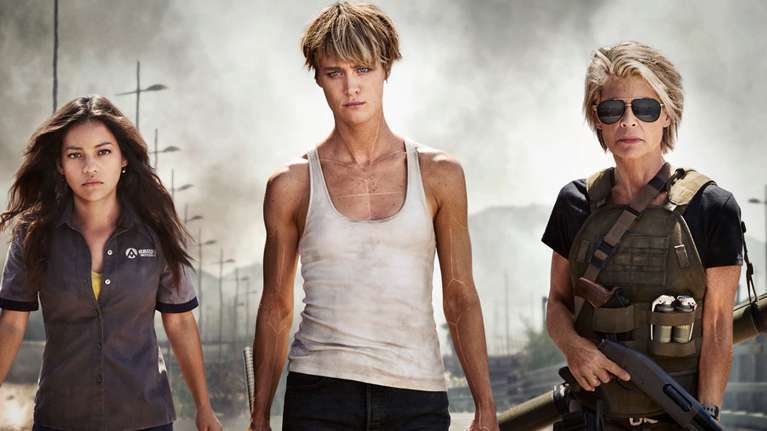 Terminator: Dark Fate hits theaters on November 1st.